As Zdeno Chara, the captain of the Boston Bruins, hoisted the Stanley Cup at the conclusion of the 2011 Stanley Cup playoffs, fans could celebrate with abandon, secure in the knowledge that their star defenseman will be wearing black and gold through the 2017-2018 season. Without the last minute contract extension signed days before the season began, however, the outcome might have been very different. Chara would have become a free agent in July, and all of Boston might have been wondering if this were his last game in a Bruins uniform. As it is, the Bruins and their fans not only have cause to celebrate today, but also the expectation of many more years of championship-caliber hockey to come. Not all sports contract negotiations end quite so happily, or see their value vindicated in such short order. In our new free report, Win-win or Hardball? Learn Top Strategies from Sports Contract Negotiations, we look at the case of Matt Harrington, a promising young pitcher in baseball who opted not to sign with the Rockies after the 2000 draft. Harrington continued to turn down contracts in subsequent years, becoming the longest holdout in the history of Major League Baseball. His greatest mistake? Choosing to approach his contract negotiation as a competition between opposing interests, rather than seeking to find a win-win solution that would benefit all parties. 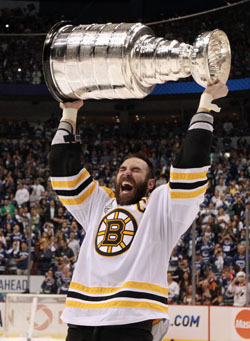 In contrast, the common desire to win the Stanley Cup provided incentive for both Chara and Bruins management to reach a deal before the 2010-2011 season began. Key to the Bruins’ success in signing Chara to his $45.5 million seven year extension was the willingness of General Manager Peter Chiarelli to explore creative options to overcome some complicating factors. The contract negotiations were stalled in part because of the so-called “Ilya Kovalchuk” rule in the collective bargaining agreement, which sets certain restrictions on contracts with players over forty years of age. Since Chara would turn 40 during his contract extension, some concessions and adjustments were needed to make the numbers work for both sides. After the signing, GM Chiarelli praised the efforts of both sides to reach agreement, and celebrated the fact that both sides were willing to make a long-term commitment to one another. For his part, Chara expressly stated that he signed a long-term deal with Boston because of his desire to win a Stanley Cup as a member of the Bruins. As it turns out, the contract extension was not strictly necessary to achieve that dream. But it is safe to say that all sides are happy to have the extension signed and pleased that the Norris Trophy winning defenseman will likely end his career in Boston. As they celebrate their first Stanley Cup in 39 years, Boston fans can be grateful that Bruins ownership, GM Peter Chiarelli, agent Matt Keator, and Zdeno Chara skillfully negotiated their way to a “win-win” agreement for all involved.